Thank all that is good and holy for Tempur-Pedic. Fo’ real. Since 2001, Team Mable has been getting a restful nights sleep thanks to the Tempur-Pedic neck pillow. We want to share this with you because it’s turned out to be one of the best purchases we’ve made in the last decade. Waking up with less stress in your neck and stiffness all over is a mighty great feeling. We don’t spend the night anywhere without making sure to bring our contoured neck pillows. They have traveled with us to 10 countries, on trains, planes, cruise ships, cars, hotel rooms, and the guest rooms of friends and family. It doesn’t matter how full our luggage is: our Tempur-pedic pillows are mandatory for travel. 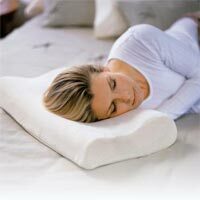 These Tempur-Pedic pillows are designed for maximum pressure relief, and the pillow sizes are custom fit to cradle your neck at the proper angle and conform to your head while you sleep. It seems so simple and I’ve tried recreating it by folding an edge of normal pillows, but it’s definitely not the same. You actually do wake up with noticeably less tension and stress in your neck. It’s one of those things you just have to experience to believe. As an added bonus the included hypo-allergenic velour covers are dust mite resistant. Take that, bed bugs! Of course the ultimate would be to get the Tempur-Pedic mattress so your entire body is supported by NASA-developed “Visco elastic” material. Along with being ultra comfortable, “studies show that Tempur-Pedic mattress reduces tossing and turning by 83 percent. You can try the mattress for 90 days, risk-free. Since there are no inner springs to worry about, Tempur-Pedic beds are maintenance-free. You don’t even need to flip or turn the mattress, and it’s guaranteed to perform for 20 years.” This has been on my personal wishlist for several years, and I’d love to try it out. With the 90 day trial, maybe now is the time. Do you sleep on any Tempur-Pedic products? How have they affected your sleep? All they did was add in the alkaline water instead of drinking bottled water/filtered tap water. With that ONE change, they began to lose weight without effort, had more energy and slept deeper, they ‘felt hydrated for the first time ever’, and the water was even ‘much easier to drink’. I’ve got good news. Now it’s your turn to try. The once a year water ionizer sale is ON. 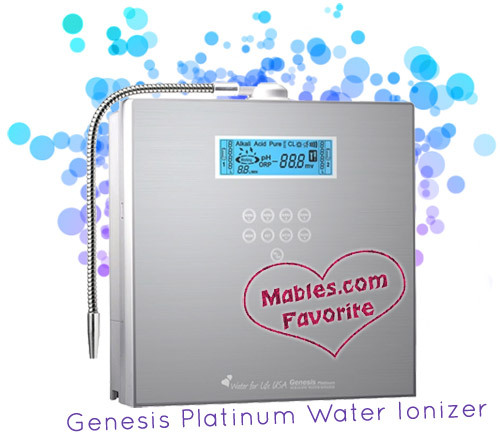 Save 15% on the Genesis Platinum water ionizer. Use coupon code “genesis15″. 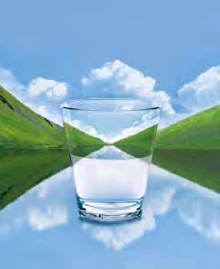 If you have questions – and I mean any questions at all – about ionized water, email me at . No Fry Corndog Maker: Carnival Food for Breakfast? You know what’s in a hot dog, right? Good. So, wanna keep your veggie dogs in the “healthy” zone? But maybe you’re dreaming of fair style deep fried food on a stick lately? Someone has heard your prayers. The “No Fry Corn Dog Maker” is just as marvelous as it sounds. Quickly create a healthier and tastier treat in three steps; prepare your favorite batter, dip in your food of choice, and bake them in the easy to clean (non-stick) snack maker. Here are some suggestions from the web store: pizza roll cheese sticks, breakfast pancake sausage rolls and even CANDY BARS on a stick! 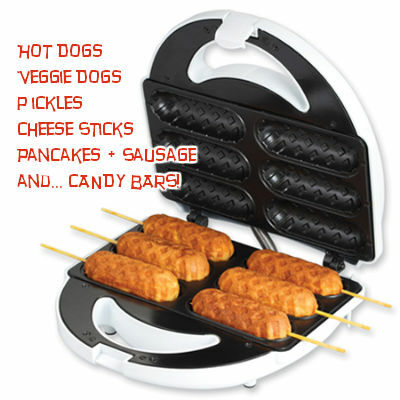 If you can dip it in batter and put it on a stick our new No Fry Corn Dog Maker can take care of the rest! What a guarantee. Includes 24 sticks and a recipe book with a classic corn dog recipe. I love to use this to create quick gluten free corn dogs. Which in the store are very expensive and not that tasty. I just kept working with the recipe until I came up with the one I love. Thank You for this product! The best thing I have come up with so far to make in this machine is pancakes + sausages on a stick. Delicious. Try it! What no-fry food combos are your favorite? Are you ready to effortlessly lose inches from your waistline? Summer weather is right around the corner and I’m stoked I found THE easiest way to get a flat tummy. I don’t care if you’re a size five or are 50 pounds overweight. This method will shrink your waist in 1 week, guaranteed. Best of all, it’s a natural method that is good to your body. 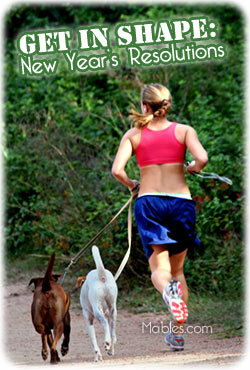 Unlike diet pills and fiber cleanses, you won’t feel tired or bloated or endanger your health. Here’s how it works. 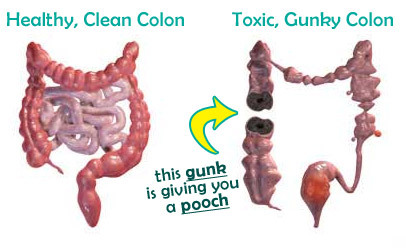 Everyone on the planet is carrying around spare gunk inside of their guts. Everyone. This is why you might be doing a bunch of ab crunches, eating healthy, and trying to take care of your body, but still have a pooch. There’s a layer of old food and cooties from your colon that is literally stuck inside of you. That stuff lines your intestinal walls and pushes your belly out to create a “spare tire” or “beer gut”. And there’s only one way to remove it: a cleanse. Get a handle on your love handles by flushing away the “gut gunk”. Oxy-powder is a unique product because it uses activated oxygen to comfortably dissolve that build-up. In just 6-7 days, your intestines & colon will be clean and your tummy will be flatter. No gas, no bloating, just a rapidly shrinking belly. This is not a diet pill, and it does not dissolve excess fat. If you’re overweight you will still need to limit your caloric intake to burn excess fat. But no matter what size your body is right now, Oxy-powder will significantly shrink your waist in just 1 week. There is even a 90 day money back guarantee if you’re not 100% satisfied. That’s how certain the manufacturers are that you will love your results. We’re big fans of natural health here at Mable’s, and we only share products that we feel totally confident about. I’ve been personally searching for a way to cleanse my body without the side effects of herbal & bulk fibers. Oxy-powder is the only product I’ve personally tried that delivers what it promises, and is truly healing to the body. Try just 1 bottle and you’ll see what I mean. Do You Know They Sell an Actual Fountain of Youth? Every once in a great while, we discover a new idea so brilliant that it takes the rest of humanity years to accept it and make it part of their daily lives. Electricity, telephones, cars, and even TV fall into this category. People needed time to wrap their heads around the idea that something so beneficial could be produced so easily. I felt the same way when I first heard about water ionizers. “A little machine that makes magic anti-oxidant water? For way less than the cost of bottled water? That has to be a scam”, I reasoned. A few years later my in-laws were excitedly telling me about the holistic health benefits of their new water ionizer machine, and I had to reconsider. Now as someone who eats and drinks in a very health-conscious way, I was skeptical that one could still make less-than-awesome food choices and feel great with the simple addition of water. And yet that is exactly what my in-laws experienced. 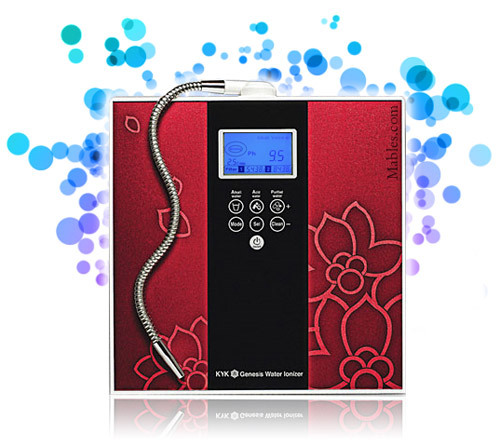 They are still loving their water ionizer and discovering new cumulative health benefits as time goes on. There are other benefits that they, and their friends have experienced, but they are so wonderful as to be unbelievable sounding so I’m not going to mention them here. Let me just say that I think Fountain of Youth would be an appropriate name for the Genesis Water Ionizer. If I hadn’t witnessed it myself, I don’t know if I would have believed these amazing claims. Ionized, alkaline water is not yet available in stores so it’s one of those products that we still have to experience through our friends and family. Or we act on faith and see what amazing results we will personally experience. Plus there’s a 60 day money back guarantee so there is plenty of time to SEE what improvements you notice from drinking and using ionized, alkaline water. Have you tried ionized water? Leave your stories, questions, and comments below and share the love! Did you know there is no “right way” to meditate? 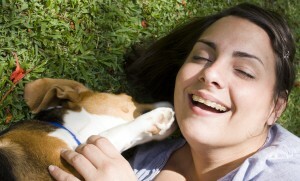 Anything that allows you to become relaxed and centered is the “right way” for you. Maybe that’s a walk around the block, singing along with an uplifting album, or sitting in your favorite chair and just breathing deeply. Yet no matter what meditation methods you prefer, our bodies respond in the same ways when we enter a relaxed and centered state. It’s called coherence: a highly efficient psychological state where all the systems of the body work together in harmony. Thanks to biofeedback machines we can actually measure how “coherent” our bodies are. Wild Divine offers 2 products that allow the user to instantly measure their coherence level, and even better, to learn to bring their body to coherence at any given time. Even if you have never meditated before, the very act of watching your biofeedback levels will begin to bring you into a state of calm. Playing with the games will bring anyone into a deeper state of inner peace. The manufacturers don’t talk about the health benefits much, but that’s the part I find especially amazing. The biofeedback unit measures the Heart Rate Variability, and HRV is the best predictor of future mortality and morbidity than any of the standard risk factors (cholesterol, smoking, exercise levels, etc). 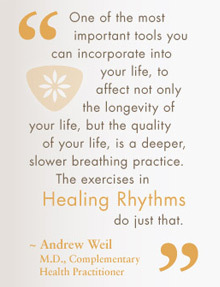 That means using a Wild Divine product helps us learn to be relax while transforming our health, too. Now that’s holistic health care. Besides the game versus training format of the two systems, my research shows one other consideration. The Passage game system does not come with detailed graphing abilities, but separate Grapher Expansion software is available. This is the package I will be purchasing, because I want the flexibility of lots of game play but still have the option to just quietly watch my body’s rhythms. Plus, I can add the Wisdom Quest game later if I want. This certainly isn’t the only way how to meditate, but it is an innovative new tool that promises to open humanity’s understanding about the body-mind connection. Have you tried any of the Wild Divine biofeedback products? We would love to hear your feedback! Image courtesy of Hector Landaeta. A couple months ago a friend emailed to tell me about a berry that I “might be interested in”. She pointed me to the now infamous NY Times article about the “Miracle Fruit“, and I proceeded to flip out. For those of you who haven’t been introduced to this truly magical berry, it makes sour things taste sweet and food in general just tastes better. How exciting is that? It contains a substance called “miraculin” that binds with your taste buds for up to 2 hours of “everything tastes like heaven” fun. Wow, talk about a natural sweetener. Sign me up! But there’s just one problem: availability. 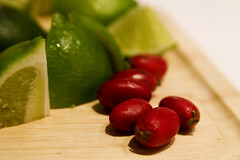 Wikipedia says Miracle Fruit was documented way back in 1725, yet it only gained popularity in America in 2008, thanks largely to the “flavor trippers” referenced in the NY Times article. Without a solid growing infrastructure in place, it’s been really difficult to obtain the berries or the packaged tablets. Most retailers run out of stock for months at a time! I tried to find some seeds so I could grow my own, but at the time nobody had any stock available. This morning I opened up an email from my homies at Think Geek and almost fell out of my chair when I saw they are now selling Miracle Fruit tablets! The date on the email said it arrived yesterday, but by the time I arrived at their site they were already sold out and taking backorders. Noooo! But since Think Geek is located in the USA (unlike most retailers) and has amazing customer service, I’m just going to backorder a couple packs now. What can I say, I have an insatiable sweet tooth and the idea of sucking on a lemon and having it taste like candy is too novel to resist. PS- I predict that this berry is going to be so instrumental in getting people to eat healthy. We’ll start by eating a miracle berry before a big leafy green salad – you know, so even the most picky tastebuds can “tolerate” real food. Then we’ll only need a half berry as our bodies become used to eating well. Then one day we’ll realize that we don’t even need to “flavor trip” anymore. Did this idea occur to anyone else? We’ve mentioned personal gardens before; AeroGarden, Miniature Garden, Organic Dwarf Lemon Tree, Garden Fort, etc., but none were soooo eco-friendly they came in a biodegradable pot! Ha! These 100% biodegradable pots are made from renewable grain husks, are certified organic, and will hold their shape and size for about 5 years. That’s a long time to grow some delicious herbs. As an added Green bonus, by growing plants indoors they will convert the CO2 you expel into Oxygen for your lungs. Yay for synergy! Order yours today and choose between Lemon Basil, Lavender, Oregano or Parsley. Remember you can always pick up your own seeds from somewhere else and use those in these organic biodegradable pots. These make great green gifts for teachers, and families with kids to help show us all what goes into growing food. Find more green growing gifts in our Plants and Gardening gifts section. Organic is one of our passions at Mable’s, and we’re always on the lookout on how we can help spread the word. I don’t want to play the fear card, but just stating the statistics is a scary thought. We’ve brought these up before, but it’s worth mentioning again. Did you know that about 1/3 pound of chemicals are used to grow and manufacture just 1 pound of cotton? And did you know that conventionally grown cotton is the most chemically treated crop in the world, using 1/4 of all toxic chemical pesticides produced each year? We lay our bodies on our sheets about a third of our lives, which, from my point of view, is too much time spent with the most chemical-laden crop in the world. Thanks to the many online retailers soft organic sheets are an affordable nightly luxury that we should all enjoy. Right now Gaiam is having an Organic Sheet Sale with prices as low as $40 per sheet. They also carry attractive printed organic sheets vs the standard solid white most retailers carry. Viva Terra carries organic Pima cotton sheet sets in queen and king, as well as organic Duvet Covers. If you are in need of other sizes I’d head over to Design Public for their organic full fitted and flat sheets. For the little ones, who probably benefit most from chemical-free sheets, Kee-Ka carries organic cotton baby bedding in solid colors and delicious cupcake patterns. Pair the sheets together with an organic blanket and your baby should be all set.